If you’ve been reading this column for a while, you’ll know by now that I have a full-on love affair with Japanese-American co-productions. Flicks like The Green Slime, The Manster and Terror Beneath The Sea all hold a special place in my cold, callous heart. So it is with great pleasure and schoolgirl giddiness that I present to you the long sought-after Latitude Zero, which is set to hit our shores in a pimped-out two-disc edition courtesy of the fine people at Tokyo Shock. What’s that, you say? You’ve never heard of Latitude Zero? Well then, have I got a treat for you. Latitude Zero was directed by Japanese film legend Ishirô Honda (the man who created Godzilla) and written by Ted Sherdeman (the man who gave us the 1954 masterpiece Them!). This film is essentially the perfect storm of Japanese-American film productions. We get an all-star cast, including Hollywood tough-guy Richard Jaeckel (The Dirty Dozen), classic hotty Linda Haynes (Human Experiments), freakin’ Joseph Cotten (Citizen Kane) and “Batman” TV villain Cesar Romero hamming it up as the evil Dr. Malic. Hell, even the man-in-suit monster segments feature Japanese acting legend Haruo Nakajima. For those not in the know, Nakajima was Godzilla for the first 20 years and also portrayed Kaiju creatures such as Rodan, Varan, Mogera (The Mysterians) and the front section of Mothra. Whatta badass cast! When a volcano violently erupts, a deep-sea vessel manned by scientists is badly damaged and the crew loses control of its ship. 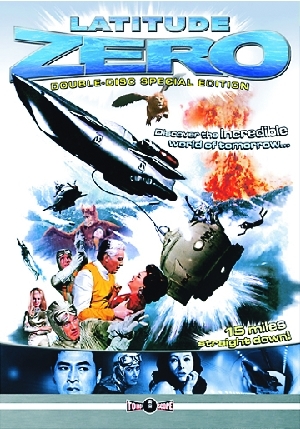 All seems hopeless until they are rescued by Captain MacKenzie (Joseph Cotten), commander of the Alpha, a high-tech atomic submarine. Captain MacKenzie takes our wayward surface dwellers to Latitude Zero, a paradise hidden 11 nautical miles below the surface at the intersection of the equator and the international date line. The population of Latitude Zero includes the greatest scientists, artists, philosophers and humanists on Earth, who decided to write the rest of us off and set out on their own. Diamonds are plentiful, gold is everywhere and no one ever grows old or dies; it is a utopia beneath the sea. Captain MacKenzie’s guests instantly fall in love with the place and don’t want to leave. Well, none except the intrepid reporter Perry Lawton (Richard Jaeckel), who is convinced the place is an elaborate hoax. Of course, someone has to try to piss in the proverbial punchbowl, and that honor belongs to the nefarious Dr. Malic (Cesar Romero), who wants to destroy the paradise that is Latitude Zero. Boy howdy, can this guy chew up some scenery. In his quest to destroy Latitude Zero, Dr. Malic employs a ghastly gumbo of anthropomorphic bats, giant rodents and even a half-lion, half-eagle monstrosity that he transplants a human brain into! He’s mad I tell you, mad! The underwater submarine scenes are fantastic, using awesome models and miniature sets. For some odd reason, this film is also known as Atragon 2, even though it has nothing whatsoever to do with that particular Toho classic. One of my favorite lines has our surface dwellers being coated with a special liquid and then shot at with a gun. As the bullets bounce off of them, one of the men exclaims, “I’ve been hit harder with ping-pong balls!” Waah?